Last week Joe Gorcsos posted on the 1991 Lone Star Open Florida Bushmaster team photo with the identification of several team members. 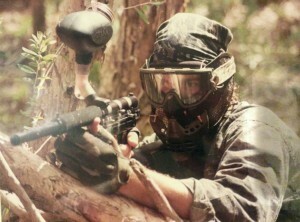 I asked Joe if he had any old team photos or other memorabilia as well as some information on his paintball history. He sent me a few photos of himself and his teammates on the team he joined after the Bushmasters, the South Florida Brush Bandits. 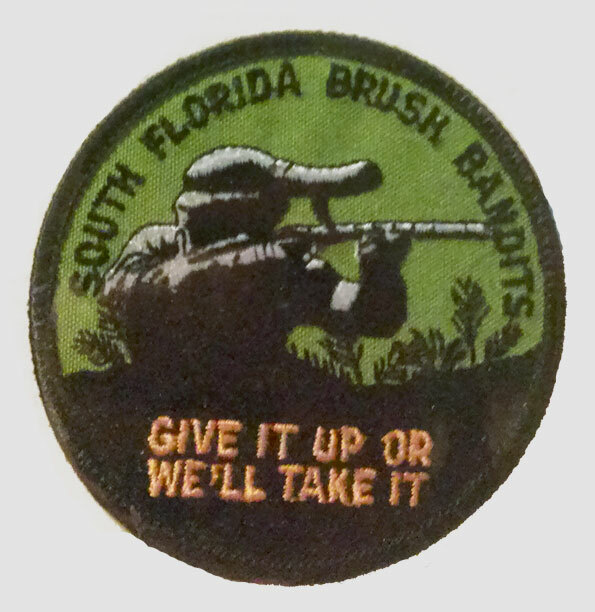 South Florida Brush Bandits’ team patch courtesy Joe Gorcsos. 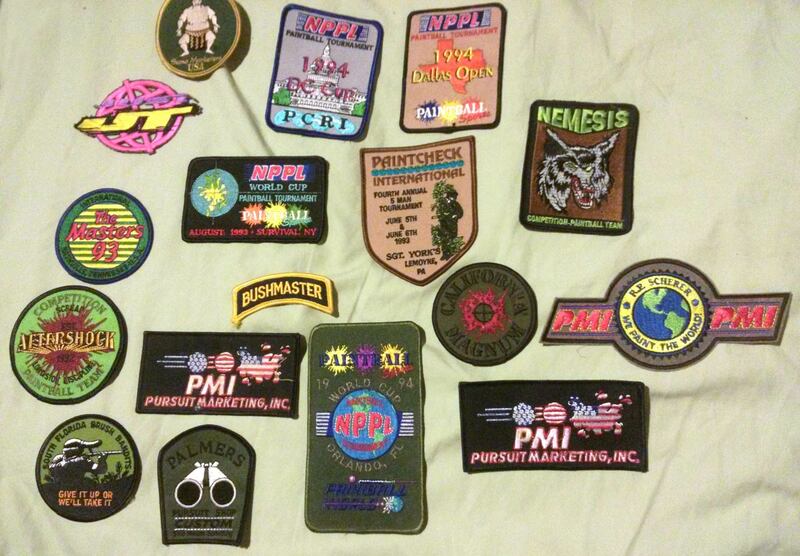 Joe’s collection of patches including the Brush Bandit’s patch and the Florida Bushmaster patch. Photo courtesy Joe Gorcsos. 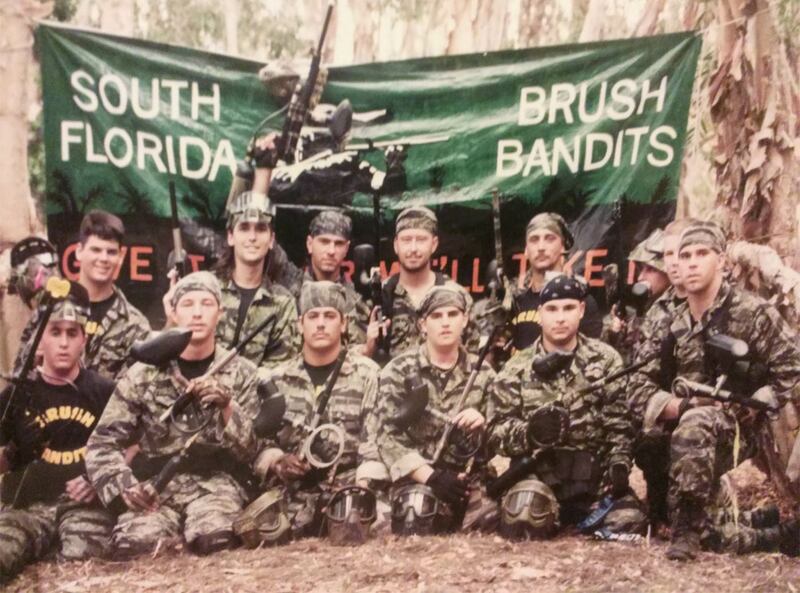 The South Florida Brush Bandit’s team photo. Courtesy Joe Gorcsos. Photo likely c. 1992. 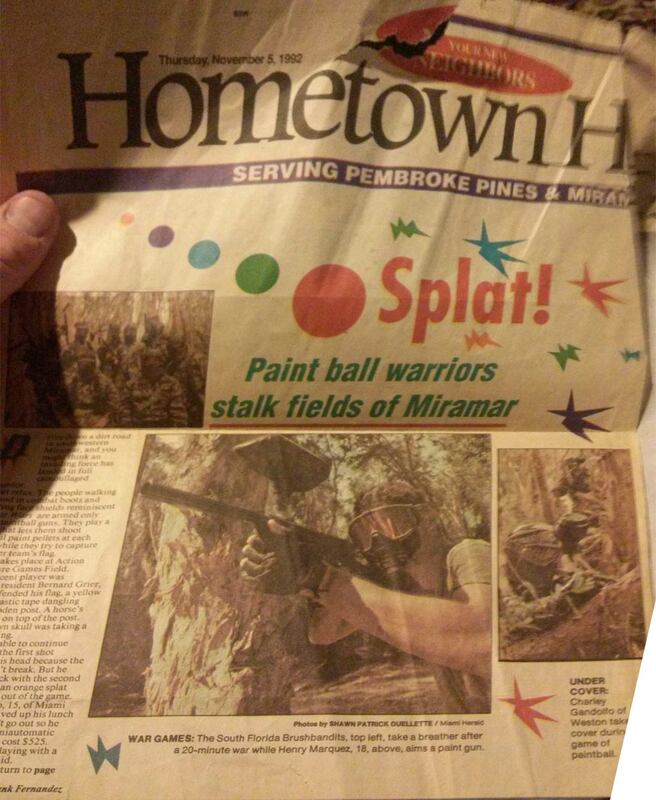 A photo of the Florida Brush Bandit’s on the cover of the Hometown Herald (part of the Miami Herald). Cover is dated November 5th, 1992. Photo courtesy Joe Gorcsos. After playing for the Brush Bandits, Joe and a few others joined with players from The Annihilators to form Rage (likely 94?). The Brush Bandit’s team photo in the Hometown Herald, November 5th, 1992. Photo Courtesy Joe Gorcsos. 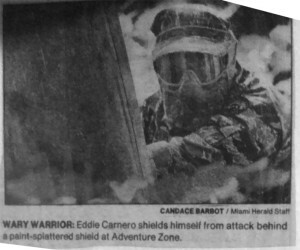 Eddie Carenaro of the Brush Bandit’s pictured in Hometown Herald, November 5th, 1992. Photo courtesy Joe Gorcsos. Joe retired from playing competitively in 1997 when he left Rage. Joe shooting a Palmer’s Typhoon or Stroker, possibly from a 1993. On Rage or the Brush Bandits? Photo courtesy Joe Gorcsos. Joe Gorcsos shooting a VM-68 or early PMI III. Cool Pro mask with a whipper snapper attached to the front. Photo courtesy Joe Gorcsos. 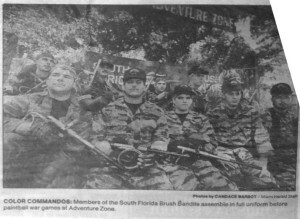 A numbered team photo of the South Florida Brush Bandits. Please comment below if you can identify any players. See larger photo above in the article. Photo courtesy Joe Gorcsos. Thanks to Joe Gorcsos for the photos and information! 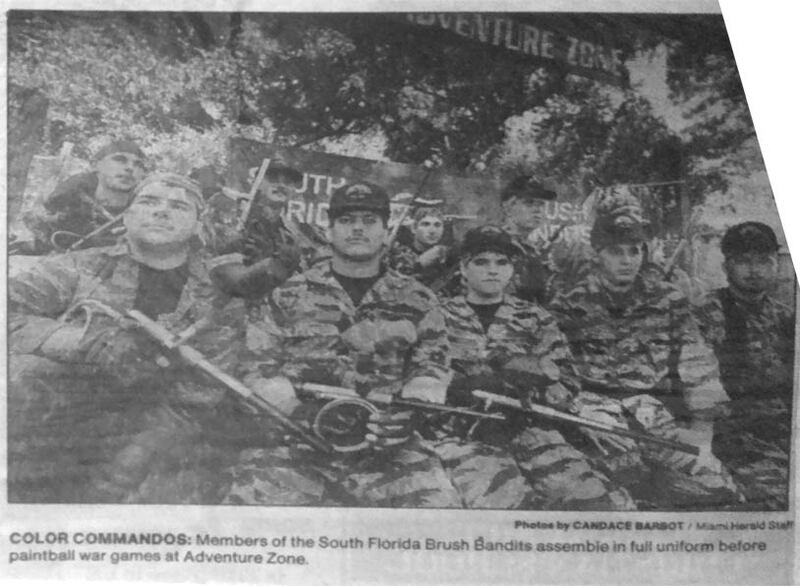 A photo of the Florida Bushmasters scanned from Paintcheck July 1991. Cool article bob moral is my father and always told about the early days of the brush bandits glad I can read about it! Thanks Michael, Joe and Bill. I updated the names on the Brush Bandit’s team photo. Any other names you remember or additional photos send them to me and I’ll post them to this article. And Michael, thanks for the dates on when Rage formed. That means you guys likely played the Lively series as Rage in 1993? Is Joe’s photo with the palmer’s semi auto from a Lively event in 93? #4 , Bill and Joe are correct. We actually practiced against the Terminators locally and that helped us transition from Am to Pro. All the local South Florida Teams got along well and helped develop each other back then. Don’t forget about Art and the Palm Beach Predators. Great team and great guys! I’m checking to see if anyone remembers Jay Thompson that played for the Florida Terminators. # 12..I was there from the creation of the South Florida Brush Bandits and Team Rage. With great times and great games. I can confirm the Terminators were not the original Rage. 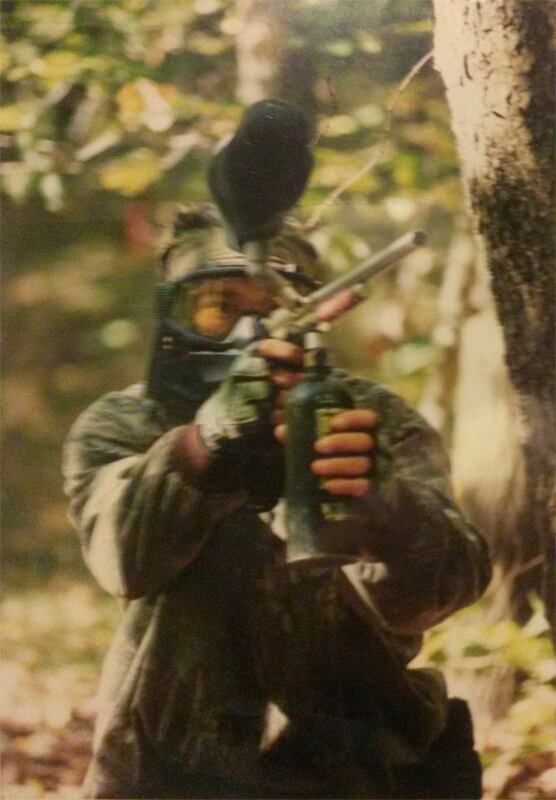 They joined a few years after Rage was already in place and in the paintball circuit.Team Rage had the type of bond that players playing next to each other already knew what his team members were doing or going to do without even talking to each other. Just how the game was going. Great group of guys. That is me “Foxy” number 10. I played with the Brush Bandits and then about 7 of us merged with the Annihilators in 1993 to form “Rage”. I played with Rage from the beginning and retired in 1999. About 5 Terminators joined Rage in 1997. We won several tournaments, including 1997 NPPL 10 Man Pro Chicago, 1998 NPPL 10 Man Pro Vegas, and 1996 ESPN World Champions.